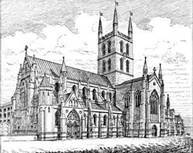 Southwark Cathedral is situated on a site where it is believed there has been a church for over 1000 years. The first record of a church on the site is in the Domesday Book of 1086, the record of the great survey of England ordered by William the Conqueror. Domesday records there was a monasterium on the site during the time of Edward the Confessor with its own wharf. Control of the site passed to Odo, Bishop of Bayeux, brother of William the Conqueror. In 1106, a new church, St. Mary Overie (over the river) was founded and served by the Canons of St. Augustine. They built a hospital and dedicated it to St. Thomas Becket of Canterbury. There was a devastating fire at the church in 1212. Only a few traces of the Norman church remain today such as the doorway in the north aisle of the nave. The current structure was built between 1220 and 1420, making it the first Gothic church in London. In 1390 another damaging fire occurred. 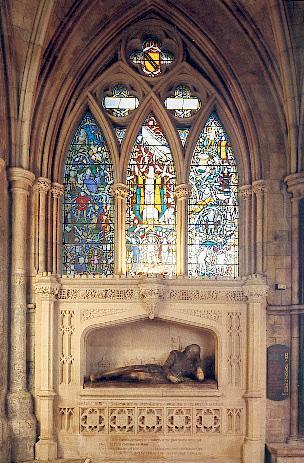 The Bishop of Winchester, Henry Beaufort assisted with rebuilding the south transept and the tower. In 1468 the nave roof collapsed and the vault was rebuilt in wood. Heresy trials were held in the Galilee chapel in 1555, under Mary Tudor I of England. The church serves the parish of Bankside which has strong connections with great Elizabethan dramatists. William Shakespeare’s brother Edmund was buried in the church in 1607 and there are other dramatists interred here. There is a large stained glass window dedicated to William Shakespeare showing scenes from all of his plays. Underneath the window is a large statue of the Bard reclining, holding a quill. This post is dedicated to my friend Dr. Bob who loves music and English literature and who played the organ in Southwark Cathedral.